Will my warranty pay for my shipping? Under warranty you are responsible for the initial shipping/packaging costs. Warranty will (in most cases) pay for your package to be shipped back to your business or home at no charge. Please call us if you have any questions requiring warranty shipping at (972)233-6600. How do I ship my unit to you? 1) For in warranty repairs we require a copy of the receipt/packing slip from an authorized dealer. Most manufacturers will offer a 1 - 2 year warranty on their products. Some of the higher end units can have up to a 3 - 5 year warranty. If you have questions on your warranty length give us a call so we can help you. If for any reason you do not have a copy of your receipt/packing slip please contact your manufacturer for further information. In most cases the manufacturer can issue us a special accommodation for coverage. Dealers In warranty repair: Please provide us with a receipt from your company to your customer. Out of warranty customers: You will need to provide us with a diagnostic fee by check or we could call you for a credit card. Please call us about the diagnostic fee and any questions about your payment. 2) Warranty/Out of warranty we require a description of your problem included inside the box. 3) Warranty/Out of warranty we require your complete contact information. Original Packaging is best as this insures a nice custom fit of the unit. We recommend a box about 3-4 inch's surrounding your unit on all sides. The unit will also need to be less than the rated weight located on the "BOX EDGE CRUSH TEST" results of the Box Certificate located at the bottom of your box. This will ensure the unit is shipped to us with no damage. Here is a image of the Box Certificate of box's we use. We do not recommend customers use packaging peanuts inside the box as this may cause the contents inside the box to shift during transit. 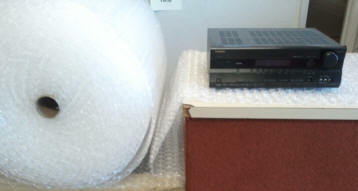 Instead we recommend using large bubble wrap until the unit can fit securely and stationary inside the box. We have received our share of shipping damage items over the years. Most carriers do not charge very much for insurance even for a $1000 insured package. It's worth having the extra security just in case.